Polycom RealPresence Trio™ 8500 | 8x8, Inc. 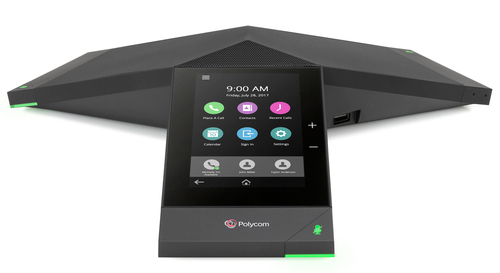 The Polycom RealPresence Trio 8500 takes your ordinary conference call experience to the next level. The 8500 is equipped with the industry’s most advanced sound quality which combines full duplex echo cancellation, and noise reduction with advanced voice processing. Combine this with 14 ft of pickup and the Trio 8500 becomes the perfect conference phone for medium sized rooms. The RealPresence Trio 8500 has a modern intuitive interface that is highlighted by the 5-inch color touch screen. This allows users to make fewer mistakes and start meetings faster.